Celebrate the season of April showers with a visit to the rainforest-like Immersion Gallery at the Detroit Zoo’s National Amphibian Conservation Center. And while you’re there, stop by to see Homer — a Hoffmann’s two-toed sloth (Choloepus hoffmanni). Homer is a favorite of many zoo visitors, even though he’s not exactly the most active and exciting kind of guy. The 20-year-old sloth spends most of the time napping in his tree. According to the animal care staff most familiar with him, Homer cops a ’tude when it comes to his not-so-favorite foods. He tends to pick through his food bowl in the morning, throwing unwanted items out of his tree and onto the floor — which is perfectly fine with his neighbor, Charo, a Central American agouti (Dasyprocta punctate) who happily snacks on his leftovers. 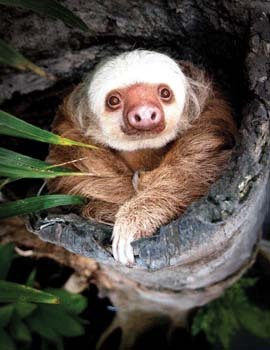 The sloth is well-named, as it’s one of the slowest moving mammals on earth. It spends nearly its whole life hanging upside down in the trees — even eating, sleeping, mating, and giving birth in this position. In fact, the sloth has such a low metabolism, it takes a while to fully digest its food — and only has to “go” about once a week.